The Favorite Aunt » Blog Archive » What Happened to the Favorite Aunt? It’s almost been a year since I last posted. I didn’t mean to take a year off, but the next thing you know it’s October and you haven’t posted since last November. 1) I had to recuperate from the Geek cruise I went on in November 2008. I had land sickness for nearly 2 weeks. At the time, I swore I would never go on another cruise, but I’ve already signed up for MacMania 10 in 2010. 2) I hosted my first ever Thanksgiving dinner. The Aunt House turns out to be a good place for having 15 people, if you can wrangle the tables and chairs. I just agreed to host it again. 3) In April, I adopted a dog. I’ve wanted to for a long time. My wish list in life has been “a dog, a cat and a piano.” So now I can check one thing off. My sister Peg (she of the Incredible family) encouraged me with the promise of dog-sitting readily available. “I don’t want to get a dog right now,” she said. “I want to be the aunt of a dog.” Everyone wants to be an aunt. I found Dixie at a small animal adoption center in Portland called The Pixie Project. Before agreeing to adopt her, I took Violet and Dash over to meet her. 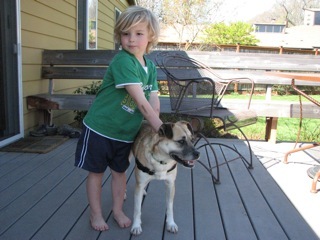 My number one requirement in a dog was that it had to like children. Dixie stepped right up to the plate. We took her for a walk and we were all in love with her. The kids helped to name her as well. Jack-Jack repeatedly suggested “Underdog,” but Dash suggested “Winn-Dixie,” inspired by the popular children’s book. Because I actually worked at a Winn-Dixie Kwik-Chek as a teenager, there was no way I could name her that, but just “Dixie” seemed like the perfect name for her. I could start a whole nother blog devoted to the ups and downs of bringing a dog into your life. I might still do that. But suffice to say, having Dixie has taken a big chunk of my free time. 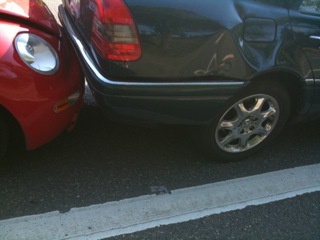 4) I had a car accident in June. A woman slammed into the rear of my car while I was stopped at a light. I really think she must have been texting. According to the doctor, she had to be going at least 30 mph. to cause the bruises I had. Nothing was broken, except the car–my poor VW bug–which was totaled. But everything was out of whack. I’ve had to do a lot of chiropractic and massage and other treatments just to get back to normal. I’m almost there. I could hardly sit at the computer for the first month, and have been gradually more able to work. Fewer hours of work + many hours of medical appointments = low motivation for blogging. 5) The kids are growing up. It feels more complicated to blog about being the aunt. They have more activities, so I spend less time with them. 6) The Favorite Aunt competition (no, it’s not really a competition) is heating up. Uncle Bob, secure in his lifetime favorite uncle status, got married last month. My new sister-in-law is wonderful. The kids love her. A lot. She better watch her back. Now she is fair game for the blog. More about Aunt Natasha later. 7) It takes a lot of time to blog! I’m attending the Blogworld & New Media Expo in Las Vegas (not as The Favorite Aunt, but for my real job). I just thought I’d do a quick update in case I mentioned this blog to anyone here. Now it’s an hour later. I could go on… but not right now! Wow! I can’t believe it has been so long. I’ve missed you in this part of the blog-o-sphere! Welcome back. @Erin Thanks! I think I have a lot of blog posts stuck in my head–I need to have a system for keeping on schedule. @Sandi: That is such a nice thing to say. Of course, I have great material to work with, so that helps. @Pat Yes, I’m going on the boat to Bermuda. Based on what you said last year, I am looking forward to a Holland America cruise. It would be fun to see you and Ron again.